Vandaag is het mijn beurt om iets op het blog van de Technique Junkies te laten zien en ik heb gekozen voor het dubble embossen van metaal. Een goede tip is het begruik van een blikje. Vooral de goedkope blikjes doen het goed, want daarvan is het metaal zachter. Je moet in de winkel de blikjes maar eens bekijken. Er zijn hele mooie kleuren bij. De kaart hier op mijn blog is gemaakt met een stempel van Viva Las Vegas en een tekst van Tim Hioltz. Today it is my turn to show something on the Technique Junkie's Design Blog and i choose to do the double metal embossing. For all of you who love to try metal in their embossing folders, I have a tip for you today: Go shopping! When you go to the supermarket and do your regular shopping, take another look at the soda cans. Some have beautiful colors (and even the drinks inside are nice too!!) . When you are home and have finished your drink, take some garden scissors and cut of the top and the bottom of the can. Now you can flatten te metal and lay it inside your embossing folder.You can also use the metal side (inner side of the can), but for the double metal embossing, the outside is great. Once you have run it trough the cuttlebug, you take some sandpaper and sand your metal before you run it trough the cuttlebug again with another folder. 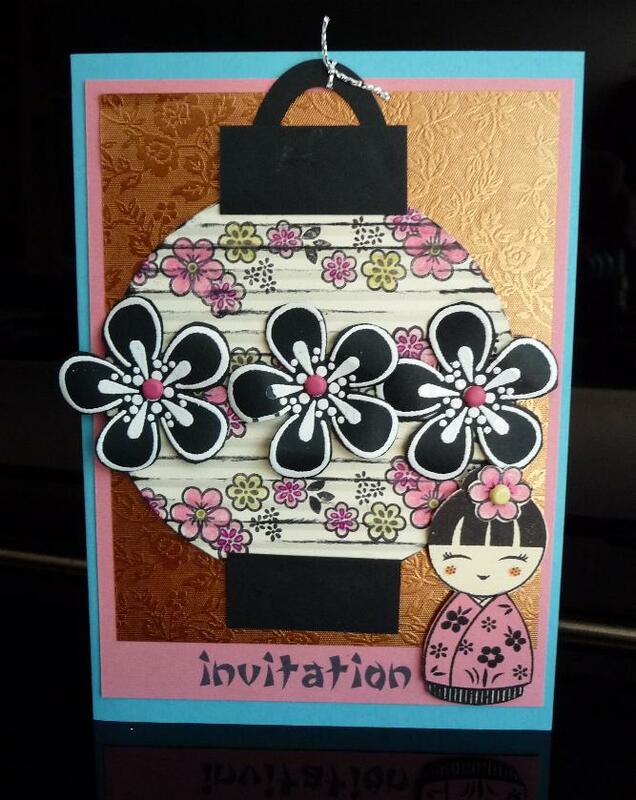 I used my asian flowers and swiss dots folder for this one. And one more tip: the ceapest cans work the best, for their metal is much softer! 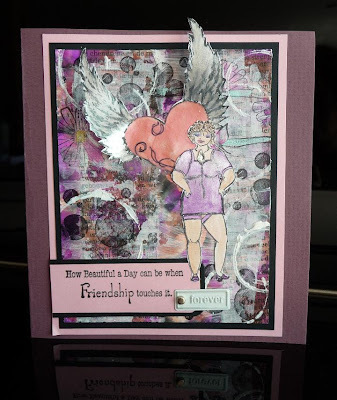 The stamps used on this card are by Viva Las Vegas and sentiment by Tim Holtz. Ik heb de achtergrond, de blaadjes, tekst en lintje gebruikt in combinatie met de bloemen stempels van Michael Strong, wat knoopjes en brads. I used their wonderful background, leaves, text nd ribbon in combination with Michael Strong stamps, buttons and brads. 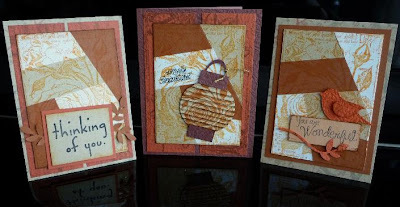 This month we have some very grungy art for you in our Firecracker Designs By Pamela May Mayhem BLOG HOP. The word grunge is believed to be a back-formation from the US slang adjective grungy, which originated in about 1965 as a slang term for "dirty" or "filthy". It's basically the kind of stuff Tim Holtz creates: rough edges, sanding, crumpling, tea/walnut stains, aged, etc. For my card I used a combination of digital and rubber stamps ( rubber: Sally Says, Chicory and dots distress and the digital "give my heart wings"). Now I guess you are interrested in how I made this grungy background. it is done with alcohol ink and there is a tutorial HERE that you can print. As usual the blog hop candy winner will be chosen from a mystery blog hostess that we don’t even know who it will be until the hop is over…so that’s why you’ll want to leave a comment on EVERY blog, so you don’t miss out! Now, to continue the circle, you will need to hop on over to CAT's blog for more inspiration and keep going until you’ve come back to where you’ve started! Thanks so much for playing along with us and we hope you have a great time! 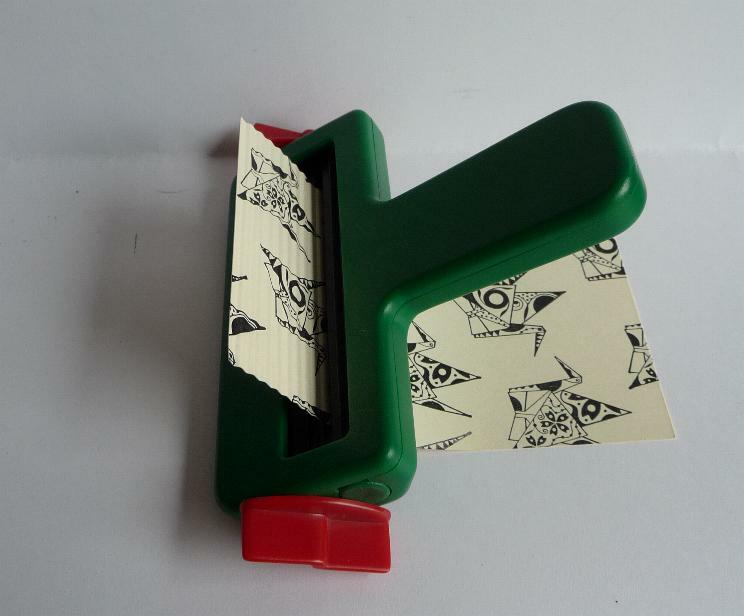 Kaartschets voor de Techno Stamper. Je kan hem HIER zien. Papier van Club Scrap, cuttlebug highlight op de achtergrond, kraanvogels van Michael Strong en de bloemetjes met een pons gedaan en bestempeld met een stempel van Michael Strong. Text is ook van Club Scrap (Blossom). Sketch card for Techno Stamper. You can see the sketch HERE. 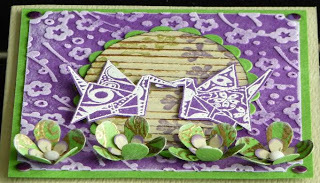 Papers are from Club Scrap, cuttlebug highlight background, cranes from Michael Strong and flowers punched out and stamped and embossed with gold (used a Michael Strong stamp). 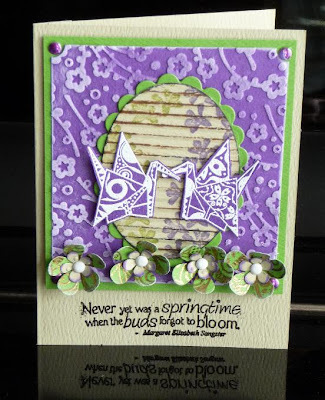 Sentiment is also from Club Scrap. Deze kaarten heb ik gemaakt voor de Gingersnap Creations GC51 "Botanical". De stempels zijn van Club Scrap evenals het papier. Het idee van de kaarten is n.a.v. een Technique Junkie techniek die heet "Triple Mosaic" (juni 2006), waarvan ze bij Club Scrap dit onderstaande filmpje hebben gemaakt. Zo heb je in een wip 3 kaarten. De techniek van het lampionnetje vind je een paar berichten hiervoor. Papier is o.a.van de Henna colectie en de roos stempel is van Simply Beautiful. The Puzzler from Club Scrap on Vimeo. 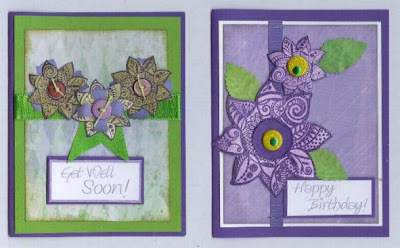 These cards i made for the Gingersnap Creations challenge GC51 "Botanical". 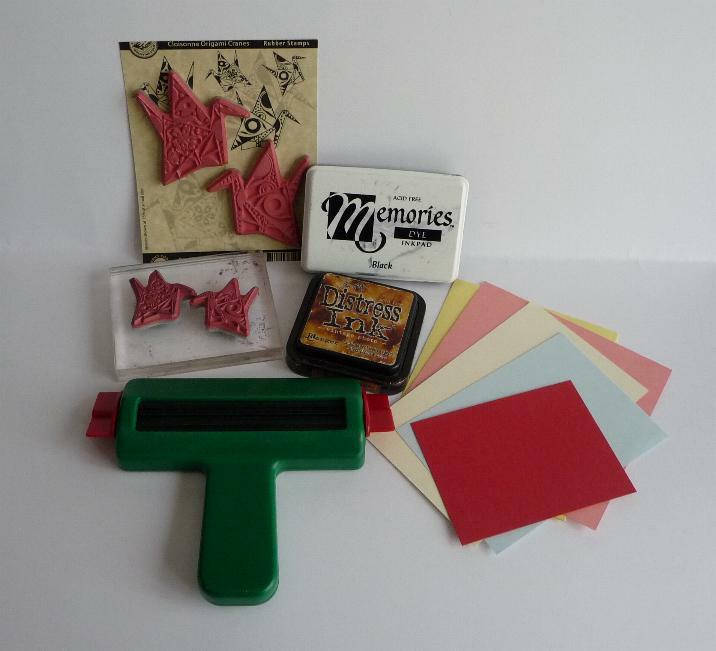 Stamps and paper are by Club Scrap. The idea of the cards is the "Triple Mosaic" technique from Technique Junkies (June 2006) of which Club Scrap made the above tutorial video. In a jiffy you make 3 cards. The paper lantern technique you find in a few posts before this one. 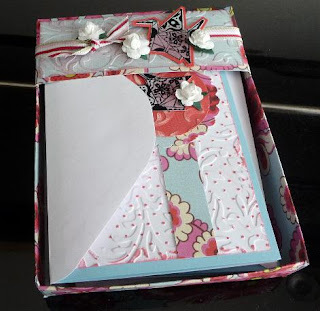 Paper is ao from the Henna collections and the rose stamp is from Simply Beautiful. Deze kaart heb ik gemaakt voor de Techno Stamper blog schets. Alle stempels zijn van Hero Arts en de tekst heb ik met de computer gedaan.. De lampion is met de "paper lantern"techniek gedaan. Het lesje staat HIER. 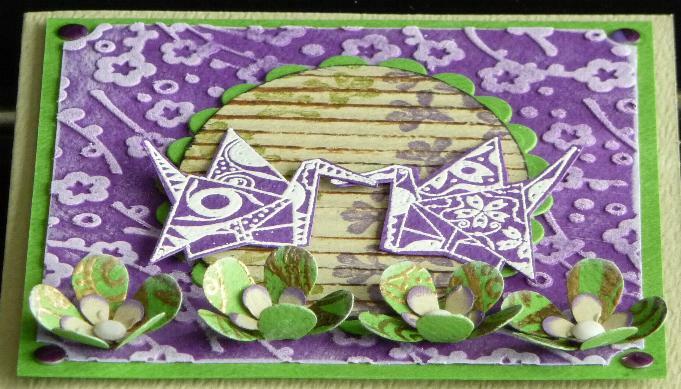 This card I made for the sketch on the Techno Stamper blog. 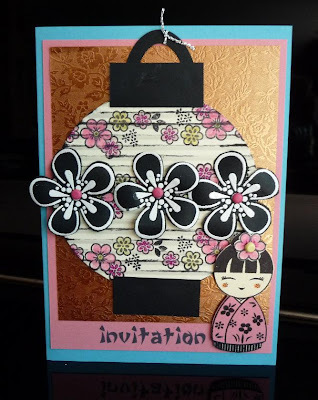 All stamps are by Hero Arts and the technique I used is called "paper lantern" and you can find the tutorial HERE. The text is done by computer. 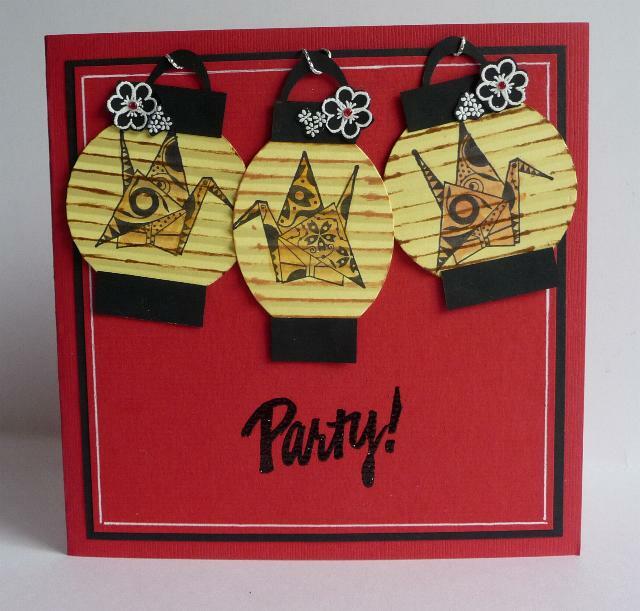 Bij het blog van de Wednesday Stamper is het thema: "Party" en nu ik toch in de orientaalse sferen ben dacht ik aan lampionnen, vandaar deze kaart en deze (al oude, maar nog steeds leuke) techniek. 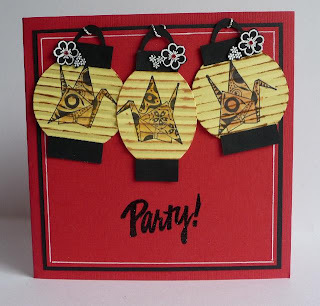 Over at the Wednesday Stamper blog the theme is "Party" and with my eastern cards I thought about paper lanterns and this (already old, but definitely fun) technique. Wat heb je voor deze techniek nodig? Natuurlijk je stempels (hier de kraanvogels van Michael Strong), papier in kleur naar keuze, zwarte inkt en bruine distress inkt en je krimper (ribbelaar). Eventueel materiaal om je stempel in te kleuren. What do you need for this technique? 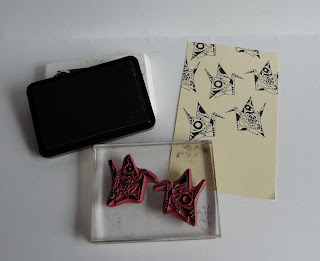 Of course your stamps (here Michael Strongs crane stamps), color paper of your choice, black ink and brown distress ink and your crimper. If you want to color your stamp you need the right materials for coloring. 1. Stempel met zwart de afbeelding op je papier. 1. 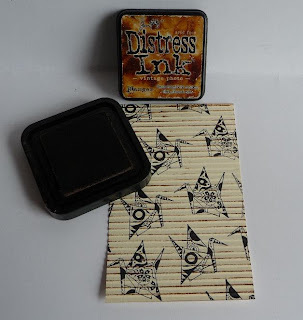 Stamp with black ink the image on your paper. 2. Wil je de afbeelding inkleuren? Doe dat dan eerst en daarna voer je het papier door je krimper (ribbelaar). 2. Do you want to color your image? Than do so now. Afterwards you crimp your paper through the crimper. 3. Neem nu de bruine distress inkt en ga direkt met het inktkussen zachtjes over het papier. Het hoeft niet overal even donker te zijn. Nu kun je hiermee een kaart naar wens maken. 3. Take your distress ink and softly touch the paper with the inkpad. It doesn't have to be as dark on every spot. Now you can finish the card to your own desire. Onderstaande kaart is gemaakt met de kraanvogels van Michael Strong en de bloemen en tekst zijn van Hero Arts. The card below is made with the cranes by Michael Strong and the flowers and sentiment are by Hero Arts. Soms is het ook leuk om met een digitale stempel te werken in combinatie met rubber, zoals ik op deze kaart heb gedaan. De digitale stempels is deze week een freebie bij FireCrackerDesign by Pamela en je vindt hem HIER. De bloemen op de achtergrond en de tekst zijn rubber stempels ook van FireCrackerDesign by Pamela. De achtergrond heb ik gedaan met een Technique Junkie techniek: witte inkt met chalk er over heen (geweldig om op zwart papier te gebruiken!). Voor de kaart heb ik me laten inspireren door de schets in haar gallery. 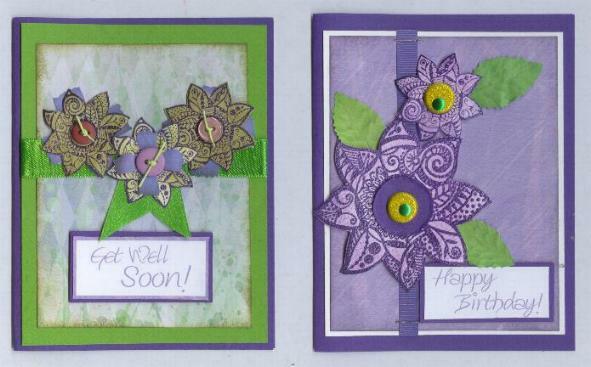 It is nice also to use some digital stamps in combination with rubber stamps as I did on this card. 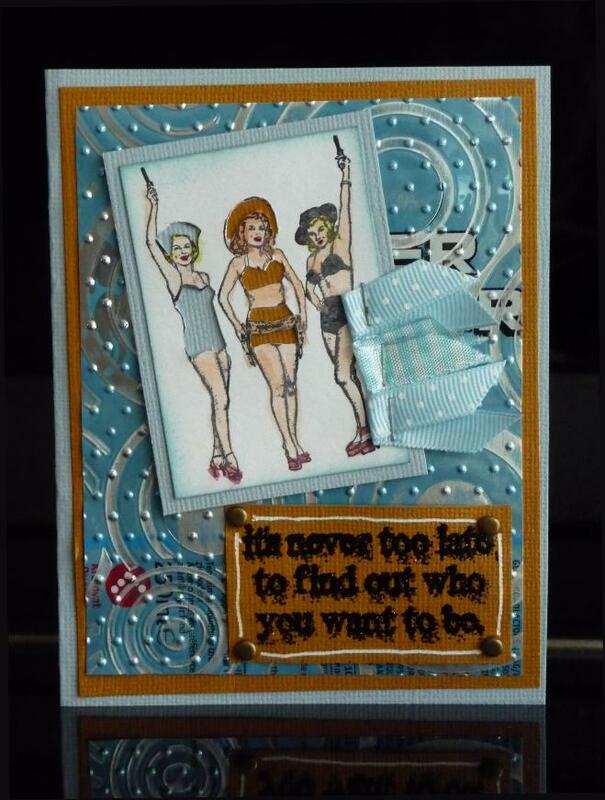 I used a digital freebie by FireCrackerDesign by Pamela and you can find it HERE. 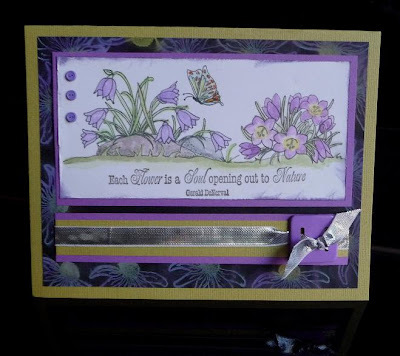 The flowers and the sentiment are rubber stamps by FireCrackerDesign by Pamela. The background I did with a Technique Junkie technique. I stamped the flowers with white ink and used some chalk over it for color (great technique on dark paper!). For the card I was insired by the latest sketch in the gallery. Fijne Moederdag allemaal! Ik heb deze pagina er speciaal voor gemaakt. Het papier is Pure & Simple van Club Scrap en de kraanvogels zijn van Michael Strong. De mooie pandafoto heb ik op internet gevonden. A very Happy Mother's Day to you all. 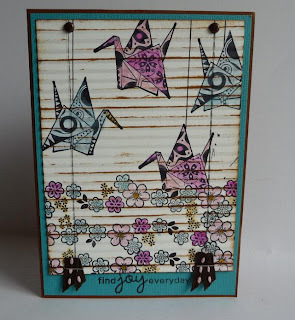 This page I made especially for today with Club Scrap Pure&Simple papers and the crane stamps from Michael Strong. The panda picture I found on the internet. Orientaalse kaart voor moederdag met de kraanvogels van Michael Strong. Op internet heb ik het woord voor moeder in het Japans/ Chinees gevonden en hierbij gevoegd. Dit kun je met de rechtermuisknop naar je eigen computer opslaan om te gebruiken. De vogels zijn op papier met een structuurtje geembossed met zwarte poeder. De achtergrong heb ik gedaan met een embossingfolder en distress inkt. 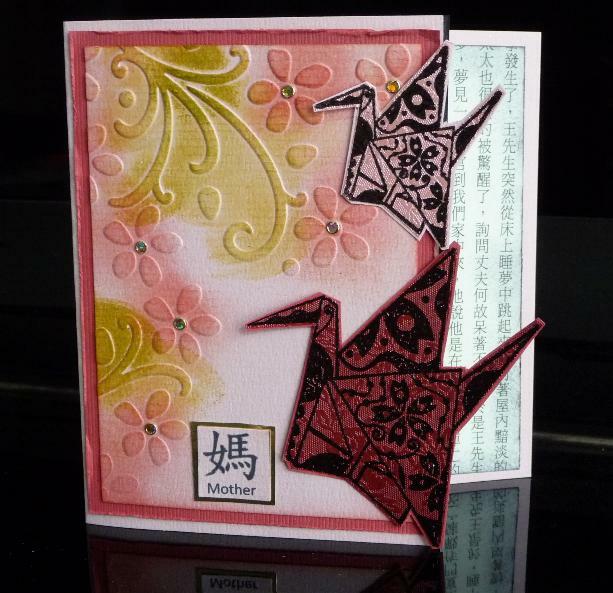 Oriental card for Mother's Day with the new crane stamps by Michael Strong. I googled the Japaneese/ Chineese word for Mother on the internet and printed it with the computer. I have added it above for you. Just do the rightmouse click trick and save the character to your own computer to use. The birds have been embossed with black embossing powder on structured paper. The background of the card is done with an embossingfolder and some distress ink. Een leuk project voor Moederdag. 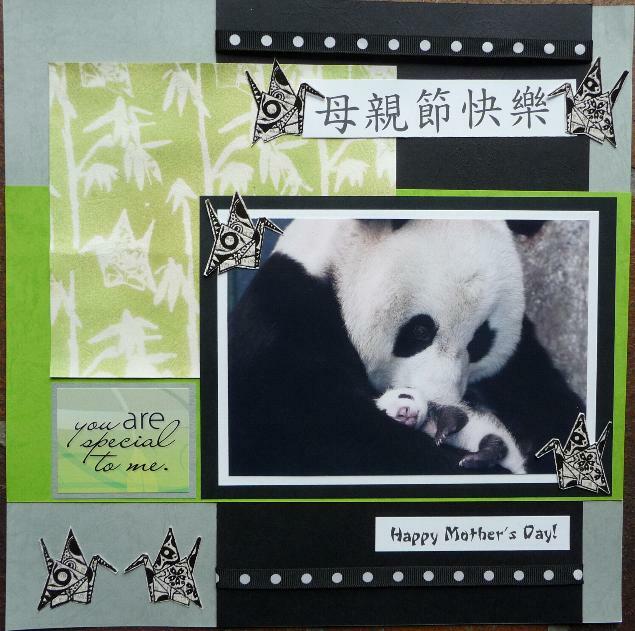 A nice project for Mother's Day. 1 vel van 30x30 cm, en een strook papier van een contrasterende kleur 7 x 25 cm, foto's en tekeningetjes van je kinderen, fotomats van 14 x 4 cm en natuurlijk lijm, je stempels, lintjes enz om alles te versieren. Dit boekje heeft plaats voor 10 foto's. 1 piece of scrap paper 12x12 inch and a strip of contrasting color of 3 x 10 inch, foto's and drawings of your children and photomattes of 3,5 x 5,5 inch and of course glue, ribbons and such to decorate the booklet. You can add 10 pictures to the booklet. Hier is het vouwschema voor het boekje. Het is handig als je het eerst rilt en dan vouwt. Vouw het vel eerst op 15 cm door de lengte. Voor de breedte verdeel je het om de 5 cm. Aan de linkerkant knip je waar aangegeven het vel 2x in. Nu kun je het geheel gaan vouwen. Eeerst dubbel en daarna de onderkant naar boven en de bovenkant daar overheen, Vouw dan de extra strip eromheen als band. Here is a template on how to fold the booklet. Start with scoring your paper lengthwise at 6 inch. Horizontal you score every 4 inch. On the left hand side you cut twice where you see the little scissors. Fold the booklet lenthwise. The bootom over the middle and the top towards the bottom. Fold the strip of paper you have around the booklet. Het papier dat ik hier heb gebruikt is van Club Scrap van April en heet Gratitude. The papers I have used are by Club Scrap and is the box from April called Gratitude. Dit is de voorkant van het boekje. Op de band heb ik een bloem van papieren zakdoekjes gemaakt. Je kan HIER vinden hoe je dat moet doen. This is the front of the booklet. On the band around the booklet I have made a flower from tissue paper. You can see HERE how to do this. En hier heb je een kijkje in het boekje, nee het is nog niet af goed gezien, maar gelukkig heb ik nog de hele week! En here you see the inside of the booklet and yes, it is not completely finished, but luckily I still have the rest of the week to finish it! 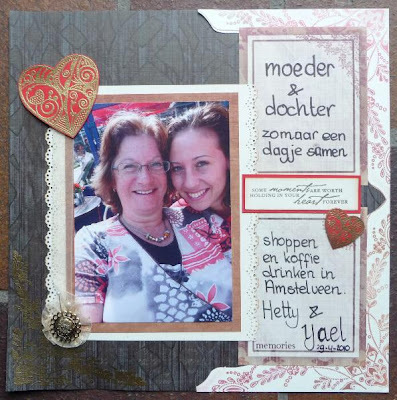 Wat doe je als het National Scrapbook Day is in Amerika? Dan maak je een pagina. Eienlijk zou het Internationaal Scrapbook Day moeten zijn, maar ja, dat maak ik er dan maar van. Deze pagina is gemaakt met Papier van Club Scrap (Gratitude papier van April 2010), hart stempels van Michael Strong en een sentiment van Hero Arts. 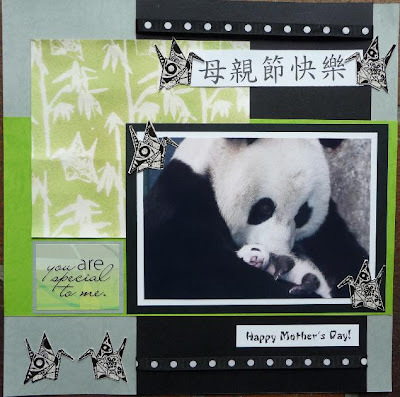 Why not International Scrapbook Day? Well, never mind, I make a page on this day anyway. I used Club Scrap papers (Gratitude April 2010), Michael Strongs big and small heart, and a sentiment by Hero Arts.